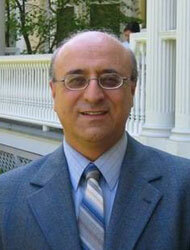 Isaac Kalimi is an outstanding expert on the Hebrew Bible and the Old Testament respectively. His expertise on a broad range of theological and historical issues will add to the research profile of the Faculties of Theology at JGU. Before his appointment as a GRC fellow, he held academic posts at high-ranking theological institutions in Israel, the U.S., and Europe. He mainly focuses on the period of the Second Temple which was built after the Babylonian exile in Jerusalem. This is where decisive cultural turns were taken with respect to the emergence of a literal tradition giving way to the Bible and for the creation of Judaism. He is best known for his influential interpretation of chronicles as integral parts of Jewish and Christian religious traditions. Press release "Theologian and historian Isaac Kalimi awarded fellowship by the Swedish Collegium for Advanced Study"